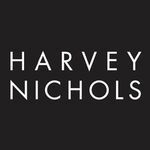 The Brasserie at Harvey Nichols serves a European menu of contemporary dishes including vegetarian options. Relax with a light meal or enjoy a three course dinner - the choice is yours. "The Second Floor Brasserie, which offers a relaxed yet stylish environment in which to enjoy all-day dining, with a modern -European menu. The award-winning Second Floor Bar offers one of the city's most diverse cocktail menus, a selection of the world's best Champagnes and a range of speciality spirits. It's the perfect place to meet friends, take a well-earned rest from shopping or spend a whole evening enjoying the atmosphere. Brasserie Monday: 10am - 8pm Tuesday - Friday: 10am - 10pm Saturday: 9am - 10pm Sunday: 11am - 6pm (last drinks orders 5.30pm) Bar Monday: 10am - 8pm Tuesday - Friday: 10am - 11pm Saturday: 9am - 11pm Sunday: 11am - 5.30pm"
What did you think of Harvey Nichols 2nd Floor Brasserie? This is such a great place to stop for a break while busy shopping. Harvey Nichol’s Brasserie offers classy, stylish British cuisine in a setting that is as elegant as the food. 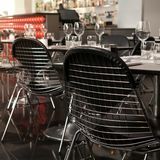 Situated on the second floor of the Harvey Nichol’s department store, the Brasserie is as modern and elegant as the swanky designer labels that occupy the rest of the store. It occupies a huge space with clean lines, bespoke lighting and, if you are lucky enough to get a table by the window, great views of Manchester’s vibrant skyline. When the store is closed, you can access the restaurant through the entrance on Cateaton Street, just off Deansgate. The Brasserie is open every day but is closed on Sunday and Monday evenings. During the day it is popular with big spending shoppers, but it is at night when there is a real buzz about the place. The Brasserie becomes a trendy hotspot for fashion hawks, who come to soak up the relaxed yet sophisticated atmosphere. The friendly and attentive staff ensure that all your needs are met, and they must be very fit because they have to cover a lot of ground whizzing around the expansive restaurant. The Brasserie offers high quality, exciting modern British cuisine with a menu of locally sourced seasonal delights. The warm smoked salmon with beetroot puree and horseradish and celeriac remoulade may bit a little pricier than other Manchester restaurants at £7, but it is worth every penny. The interesting mix of flavours work extremely well together and compliment the soft smoked salmon perfectly. All of the main courses reflect the Brassiere’s modern, original approach to British cooking. The pan-fried fillet of seabass with bubble and squeak and roasted garlic cream (£13) is a perfect example of the fusion of tradition and modernity. Their delicious, creamy version of bubble and squeak gives this old favourite a stylish new lease of life. Pairing it with the soft, succulent sea bass is an inspired success. The dessert list, which is also priced above average, continues to offer revitalised, elegant renditions of British favourites. If you are treating yourself, the indulgent waffles with blueberry compote and vanilla ice cream (£6) is not to be missed. 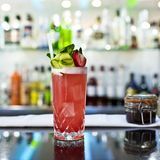 There is a varied range of drinks on offer at the Brasserie, to suit any occasion and time of day. If you are popping in for a late breakfast, you can choose from a good range of coffees and teas. If it is later in the day, the Harvey Nichol’s Pinot Grigio is a tad indulgent at £23.50 a bottle, but it goes very well with the smoked salmon starter and sea bass main course. There is also a range of international beers to choose from, including Cusquena and Budvar (both £3.25) or you could try their cocktails, they’re very good. 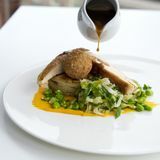 The sleek and stylish Brasserie at Harvey Nichol’s is the place to go if you want to sample modern British cooking at its best, without having to pay Michelin star prices.